n 1950 my family bought a console radio. Our Magnavox was a big cherrywood box. The vacuum tube radio had a backlit tuning dial. Also included was a record player and an empty box. The salesman pointed to the hole and said, “This is for television. One day you will buy a television to put here, and then you will never turn the radio on again.” Our family sometimes gathered in a circle around the radio to listen to the classics: Fibber McGee, Gunsmoke, the Great Gildersleeve, Burns and Allen and many others. I was especially fond of radio dramas. Wearing my cowboy hat, I would sit cross-legged in front of the speakers, my cap gun at the ready. When my heroes–Hopalong Cassidy, the Lone Ranger, and Sergeant Preston of the Yukon—got in a tight spot, I was ready to add my gunfire to help them. Later my parents bought a cream bakelite AM radio from the downtown “Monkey Wards” store. The Airline became my personal radio. I listened to it in bed when I was supposed to be asleep. One dark winter night when I was about fourteen I was shocked to hear Elvis Presley sing “Heartbreak Hotel.” That was a lonely, confused period of my life. The anguish in Elvis’s voice, amplified with all that reverb, proved that at least one other person on earth understood my turmoil. The Airline became my magic carpet, taking me to strange and distant places. At night the world accessible by AM radio was thrilling, for then the “clear channel” radio stations could send signals to lands far away. I liked a jive-talking DJ in Louisiana who called himself Gatemouth. He was a Cajun version of Wolfman Jack, and he played an earthy type of r & b, artists like Howlin’ Wolf and Muddy Waters. This was my only escape from white bread Ames, Iowa. I later learned that a kid in northern Minnesota, Bobby Zimmerman, also lay in his bed at night listening to the same music. Radio entered my life again in graduate school, once again at a desperately lonely moment. One station in Minneapolis played classical music in 1965. They published a monthly playlist. I pored over that schedule with a highlighter, marking the pieces I most badly wanted to hear. Sometimes I’d run home after classes to click on my radio and relax with great music. Years later, early in my marriage, I read that a new station would broadcast classical music. When the first KSJN broadcast aired I was in my living room, fingers on the tuning dial, waiting for it. It could be tricky to find KSJN in the morning because the host, Garrison Keillor, was often silent for long spans of time. I later decided those long pauses were to let the host smoke. engineer. The banter between them was so witty and interesting that I concluded that “Jim Ed Poole” was just a voice Garrison could do (the way Steve Cannon voiced the characters of Ma Linger and Morgan Mundane). In 1983 Dale Connelly joined Tom Keith to do the Morning Show. We would have several radios tuned to it so we could listen to the show while moving from room to room, showering, brushing teeth, and drinking coffee. The LGMS tunes and Dale’s witty skits were the soundtrack of our mornings. Birthdays and anniversaries were marked by requests that Dale and Tom never failed to honor. By that time, the only set moment in our week was the broadcast of The Prairie Home Companion. Our lives were chaotic and unpredictable with the single exception of Saturday evening. I realized that our fidelity to the show brought us full circle back to the time when radio broadcasts were enjoyed by a family sitting around a living room radio. Molly used to fall asleep listening to Lake Wobegon monologues. In a real sense, Garrison, Dale and Tom were honorary members of our family, often present and always welcome. Radio was central to life in our weird cabin on the shores of Lake Superior. We could hear five public radio stations there. My favorite was the student station at the U of M at Duluth. They played a superb mix of folk music Saturdays after PHC. I listened for hours while swinging in a hammock in the dark. Folk music would blend with the rhythmic sloshing of waves and the occasional bark of a fox calling from the bush. Radio played a crucial role when my wife left. I processed the emotions of divorce by walking my dog with a Sony headset radio clamped on my ears. Spook and I walked two to five miles a day. We were an odd figure in the neighborhood. Spook pulled 30 pounds of logging chain, a way of giving him a good workout at low speeds. I followed him holding the leash and listening to KNOW while trying to make sense of my life. When Katie, my sweet setter, entered my life, she and I walked once or twice a day. We almost always walked a long loop in the Minnehaha Off-Leash Park. Our path took us past the great spring that is the origin of Coldwater Creek, a spot the Sioux regarded the center of the universe. At the far end of our loop Katie was usually hot enough to want to wade into the Mississippi. I was usually alone for these walks, but I had Catherine Lanpher, Robert Siegel or the Car Guys for company. What has radio meant in your life? Thanks, Steve, for painting such a perfect picture of Life with Radio. My one word answer would be, “Everything”. I moved to St Paul from Connecticut somewhat impulsively in 1973, having finally finished my college senior project in order to get a real diploma to replace the fake I had been handed when I walked the previous June. I got an apartment pretty quickly as I wasn’t TOO welcome in my brother and SIL’s newlywed home. I’d never lived alone before and that apartment was QUIET and I had no job and no friends other than my newlywed brother and a newlywed college friend. Until my parents shipped out my ol’ KLH receiver/record player, I had only an AM radio (agony). When my receiver finally arrived, it was such a blessing to be able to find KSJN on the dial. When the June pledge period arrived, I HAD to join but was too poor to afford the $18 annual membership so I paid in installments of my own creation. Thus my renewal date ended up in September, never coinciding with a pledge period again. (of course, now I’m a sustainer). I have listened to all the station configurations since then including LGMS from the Garrison days on. The radio again became my constant companion when wasband #2 became history and sons#1&2 moved out. Working from home, I listened to Classical so that I could concentrate, mostly. My customers (fellow employees around the country and abroad) would sometimes comment on the beautiful music they could hear in the background. After work, the News is my friend – though lately, the depressing nature of what’s going on has been known to move me to Classical, the Current or even the Oldies station. My many CDs gather dust because it’s just easier to have someone else create my playlist. I guess I could resort to that if I didn’t have radio but I’d rather not. Nicely said, Lisa. I have fallen out of the CD habit so much I scarcely moved any of them to Oregon. I’d rather experience the surprise of radio rather than replaying the same music all the time. Radio signals morning to me. In the little town where I grew up they had a radio station, 1410-KLEM. We listened to the morning news (7am), Paul Harvey( 7:20am) and my favorite, The Trading Post (7:45am) where one could buy and sell anything. 10am brought Mercedes Moir who read recipes on air and focused on homemaking issues. This was a comforting, predictable routine. Other families watched the Today Show on NBC. My stodgy parents stayed with the radio routines of their parents. Fast forward to 1979 Minneapolis and Grad school and the routine became that of MPR, in a process almost identical to what Steve described. Then came June, 2010 and You Know What and here we are today. I still listen, but the loyalty and comfort of TLGMS is absent for me. It interests me, Jacque, that our TB society has people so passionate about the LGMS. If we care so much, how is it that it was allowed to die? Are we that unlike everybody else? Or is there actually an aching need in people like us that the marketplace still could tap into? I loved WPR’s line-up on the weekends with folk and the old radio shows. It seems beyond bizarre to me that the Twin Cities, with 3, count ’em 3 public radio stations has no place for something that in many markets with only one public station manage to shoehorn in someplace. The gossip at the time was that it was some managerial opinions and issues. Otherwise, I don’t know why. As I said on Wednesday I expected they would do something to address the market for this, but no one asked me, so why did I expect that? I have been curious about why no other radio station or media organization (i.e.TPT) has not stepped up to replace it or address this niche. It remains a niche. I have heard from the folk musicians themselves that they greatly grieved the loss of this venue to feature their work. I started listening to MPR when I started at Concordia in 1976. I never had a TV in college and I had longed to be able to listen to classical music.I felt like I was in heaven. In Canada I listened to the CBC, and still had no TV. I got introduced to folk music at the Winnipeg Folk Festival, and loved the Morning Show whenever we would travel back to Minnesota. When we lived in Indiana we were pretty close to Indiana State in Bloomington, a great music school, and we loved Indiana Public Radio, still with no TV. When we moved out here we found ND PUblic Radio, and then, about 6 years ago I discovered live streaming and rediscovered the Morning Show. We always have music playing, radio or CD, and STILL had no TV until about three years ago. The other day daughter informed me that she has classical MPR on in her car when she drives because it helps her concentrate. This summer she is working with emotionally disturbed teenagers, and the threat of NPR and the news is enough to elicit really good behavior when they are driving around Fargo to activities. In the early 90s WSCD had a quarterly newsletter. The last issue’s cover story was about a 4 year-old who was tuned into Mozart. I wish I could remember his exact words, but who knows where the newsletter lives now. Pretty much the same to me as it has to you. except the dates are a bit later and I don’t remember that our family got a big honking radio in a giant wood cabinet. I latched onto Leigh Kamman and “The Jazz Image” back in college. Got hooked on MPR up in Carlton, MN when I was at my first job, teaching. PHC is a regular weekly entertainment for my wife and me. I can’t remember NOT listening to TLGMS. Winter weekends are spend listening to the great shows on the News and Information Station as I balance the books for the week or work on my computer. I used to love the live Orchestral Concerts broadcast weekly on the Classical station, especially the MN Orch. Also got to hear Cleveland, Chicago, LA, NY, and a few others, I believe. Had my transistor radio glued to my ear as a boy while I fell asleep listening to WDGY (KDWB was only in an emergency. 😉 ) Beatles, Beach Boys, all the great mid-60s bands, especially the one-hit wonders. I wore out a heck of a lot of batteries when I fell asleep before turning off the radio. Nowadays, I love cranking up my solar-powered/crank weather radio with AM& FM capability when I’m in the BWCA. WTIP comes in nicely in the east, the International Falls translator of MPR does the job in the west. Makes those dark nights around the campfire on a solo trip a little less lonely and spooky. The great thing about radio, as opposed to TV, is its portability, so one can be comforted and kept company during the loneliest moments of our lives, almost anywhere in the world. Yes, Chris. Radio is so much more companionable than TV. The guy who told us we would never turn on radio again didn’t imagine how radio helps make a long auto trip so much more pleasant, almost like there is another person present. When I visited my grandparents in St. James, we listened to old time polka music from New Ulm. In high school I listened to whatever music came out of the Cloquet station. They played country western, pop and even some classical from time to time. When I worked in Port Angeles WA, I discovered the CBC and spent the next several years searching for a similar sound and programming in Colorado. Finally found a classical station from Denver. Then we moved to Minnesota. The first APHC I heard I was immediately hooked. Garrison had a dentist on who played music on his teeth. Then WSCD came on the air in 1975 and sometime after that I discovered Garrison on the Morning Show. The “commercials” delighted me and the music…the morning I woke up to Gordon Bok, Ed Trickett and Ann Mayo Muir singing “Turning Toward the Morning” is still stuck in my mind. Trying to explain Garrison, the Morning Show, APHC to my Leadville friends was quite fun. TLGMS with Dale and Jim Ed. Well, what can I say…I still drink from the 25th Anniversary mug each day. Just yesterday a friend and I were talking about how important the show was to our mornings. Working for MPR was rather a logical step in my “radio” life, ultimately helping me pay for my life style. Yup…radio is still important in my life. Thanks for the memories…and for conjuring them up, HVS. The very first time I listened to Garrison’s morning program, he played Turning Toward the Morning. I found it remarkable, and it surprised me that it was so unlike anything else I’d ever heard. I was familiar with “folk music” from that time when Peter, Paul and Mary were popular on local radio stations. Garrison played a type of folk music that was thrillingly new and not glossy–artists like Helen Schneyer. I have been known to do wedding flowers. I am certain I could manage the virtual type for the virtual wedding, etc. We won’t have to hire an organist for music during the service. Public radio seems more appropriate. I’d be happy to sing it or VS, BiR and I could do a trio version. I, too, applied for a job at MPR. Horrible experience! The woman who interviewed me was so scornful that I had a panic attack in her office. Then I got in my car so distracted that I made it two blocks from MPR before smacking into the tail end of some old guy driving a Ford Fairlane. And I see in the paper today that the news section laid off 9 people. And a lot of my VO colleagues do not have nice things to say about being in radio. But considering my feelings about the industry that I’ve worked in for 25 years, I’d still like give it a try. I used to fall asleep with my transistor radio (circa 1965) tuned to whatever distant radio station playing rock and roll that I could get: WLS in Chicago, KOMA in OK, the singin’ pig in Lil Rock Arkansas (can’t remember the letters), WHO in Omaha. It was a magic carpet to those far away cities! Maybe so. There is one in Omaha and that is the one that played rock and roll at night. The transistor radio was a game-changer when it came along. 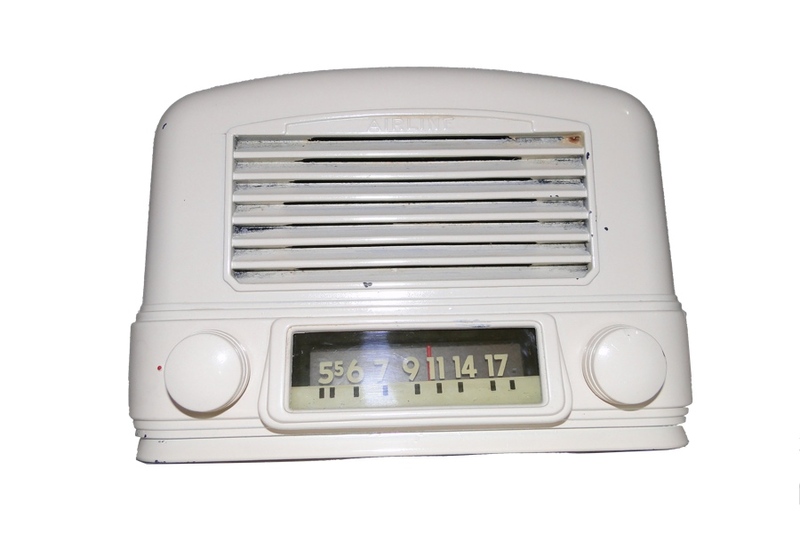 Radios were originally expensive and large. A family would have one, and it was centrally located in the living room. Then smaller, less expensive radios like my Airline made it possible to have a radio in several rooms, but they were still tethered to electric outlets. Transistor radios shattered those limitations. Driven by batteries, they were light and compact. Suddenly you could take radio anywhere, even to the beach. And radio took a big step evolving from a family activity to a private activity, so each person could have his or her own radio experience. The development of radios with headphones were yet another step, for they delivered a personal choice or radio to a listener who was isolated from others by the headphones. Transistor radios also revolutionized Americans’ perception of Japanese products. After the war items sold with “Made in Japan” stickers on them were assumed to be cheap and lacking in value. Transistor radios were the first electronic product made in Japan that attracted respect. Early transistor radios were marketed in ways that seem strange now. Fine watches in the 1950s were marketed by how many jewels were included in their movements. Early transistor radios competed with each other based on how many transistors they had, as if an eight transistor radio was that much nicer than a six transistor radio. Who knew? You have a detailed knowledge of these, Steve. Mine was little. Batteries did not last very long at all. Every night that I fell asleep with it, the batteries would be dead the next morning. Then I could not listen at night until I saved up enough allowance to go back downtown for a new batch of batteries, which started the cycle over again. Radio became an essential part of my day in the early 70’s, my tween/teenage years, when KQRS was experimenting with a progressive rock format that loosened the three-minute limit on the length of time permitted per song, and let the personal taste of the disc jockeys influence the musical selections. The on-air people were not so much personalities as program directors. They included Alan Stone, John Fine, John Pete, Susan Bradley, Randi Kirshbaum, Kevin St. John, and others whose names are escaping me. Susan Bradley and Randi Kirshbaum were trailblazers, as they were the first two female disc jockeys in the Twin Cities. There was great excitement in the announcers’ voices when a new album was released by someone like Van Morrison or Joni Mitchell, and they would clear 45 or 50 minutes and play the entire album all the way through. I made notes on my favorite songs so I would remember what to look for when I scraped together enough money to buy an album. At the time, it cost about four dollars to buy a new album, unless it was a double album. They also played some old radio dramas, like The Shadow, and a half-hour comedy show produced by National Lampoon. The station’s sponsors were mostly record stores and head shops like the Electric Fetus, Down In the Valley, and Oarfolkjokepus…at least as far as I can recall. Still recall the jingle for Down In the Valley. The station hired consultants and cleaned house around 1976 or 77 or so. It was the end of an era. Soon after that I got my first full time job, as a copywriter at a radio station. Radio paid many, many bills over the years for me. I do remember my folks listening to old shows like Fibber McGee and Molly, and Jack Benny, probably early 50s. Then it was a classical sound track, KAYL in Storm Lake, IA, until I got my transistor radio for my 12th birthday. By the time I was teaching in San Francisco, I’d learned to appreciate the companionship of radio. There was a great soft rock station there (KQED?). Fast forward to the early 80s when I found PHC – bonded with people who listened when we were in grad school in Muncie, IN. When we returned to Mpls. in 1985, I was delighted to discover that Jim Ed had teamed up with this funny guy Dale Connelly… for one pledge drive there was a tape they’d put together called “Our Favorite Bits”… wonder if I still have that. The rest is like Steve has so eloquently related. I now have my HD radio in the kitchen, flip back and forth between Radio Heartland and MPR news and KFAI. I keep picking up CDs at various places (did just get a couple of Eva Cassidys from the library…), but don’t listen to them as often as the radio. I have that Favorite Bits tape, BiR. Fallen out of the radio habit. The MPR classical signal is stronger here now, but my family in Evan cannot get it. They subscribe to Sirus radio (is that the right name) where they can build their own stations. Wonderful for all the driving my daughter and s-i-l do. The family favorite is Jimmy Buffet. I mentioned the other day Sandy and Internet radio, specifically Lutheran Public Radio. Sound is do often an issue that I do not listen to much of anything. I remember when I used to listen the TLGMS with a bit of paper and a pen nearby so I could write down the names of songs or singers I liked. The show played so much music that was both highly likable and unlike other stuff on commercial radio. Stuff like John Gorka’s Trees in Love. Lake Baikal by Russian male choruses. What’s the one about Paddy can’t be at work today? Reminds me, have you heard from Mike Pengra about our requests for Radio Heartland, VS? I was wondering the same thing and hoping I hadn’t missed it by not being on top of every TB post. Trees in Love was Free Hot Lunch. Long ago KUOM used to play some really interesting stuff. It isn’t often mentioned, but KUOM is where Garrison did his first DJ work. I think it was KUOM that used to play incredibly funny stuff from England, The Goon Show. Wild, funny radio! My son was a dJ at KUOM and KUMD. KUMD was (and I’m sure is) a great station. We’d sit and close our eyes and use our imagination. Together we sat, listening madly to our favorite show. Radio … Why did you ever go? Oh, won’t you please come back and entertain us? Radio … I miss you so. Would send those shivers up my spine. There are too many topics I want to respond to! It is now considered shameful to admit liking Amos and Andy. Well, as a kid I loved that show. And it was not racist, for I had absolutely no idea the were black! I too remember listening to Amos and Andy late at night on a little crystal radio shaped like a rocket ship. The radio didn’t pick up many stations and that was what was on. I wasn’t evolved enough at that time to recognize it as a latter-day minstrel show. …and if I remember correctly (I’ll have to check), the voices you heard on the radio were not, in fact, black. The roles weren’t played by black actors until the show transitioned to television. It is complicated, bill. The early broadcasts did use white actors, but they were doing humor based on African-American cultural stereotypes. I didn’t understand that when I was eight and a fan of the show. My dad told me that he remembered when War of the Worlds aired, and he went outside the farm house to see if the aliens had actually landed. then came the fm wave with glover and ray and the heavy psychidylic music that we all loved. then somehow i reverted to vinyl. the radio got me started but never followed through the way i wanted. columbia record club became very expensive so i went to the wax museum and bough records for a dollar a piece. today i have pandora (thats where you build your own radio station) and have a yo yo ma station and bob ylan station and a tom waits station along with lyle lovitt station that allow me to bend a session in one direction or another . tom waits seems to get it better than most . i dont know if he has any influence or if its all the stuff i het that i like and add to his channel vs others. i have an interest in learning the intricacies of how to do it today but the time is another question. i am too eclectic and when i hit the shuffle button on my cd 400 disc player the stuff i ge tto listen to makes me wonder how that stuff ever made it into my collection. i do remember falling asleep to my old brown baklite radio with that warn yellow light behind the dial. mrs brown youve got a lovely daughter and red rubber ball. dream dream dream and all shook up. life was simple then/ maybe it was just me. i was simple then. Glad you are getting what you want from Pandora. I should try it again. I did once, but Pandora kept playing stuff it thought I should like instead of what I told it to play. I have trouble listening to Radio Heartland. It is complicated, but the fact it is a split from another signal means my current radio has trouble tuning to it. But I’ve been finding lately that the Radio Heartland sound is harsher than I prefer. My basic station these days (when I’m not following the news) is Folk Alley. It plays music more like TLGMS than anything I’ve found. KUMD plays Folk Alley from time to time instead of Folk Migrations. A bit more professional sounding host than the UMD volunteers. I agree with you about Radio Heartland…too much electric sound. And I have to stream it which can be a less “public radio” sound coming through the computer speakers. Yes, I listen to RH until it morphs away from mellowness. We have Pandora in our waiting room at work which needs soft, ambient music because it is such a tiny space. We identified a few stations that work for us, but after a day each channel works in Christian hymns–I mean really. The yoga station needs Christian hymns? I like my hymns, but in church, not my waiting room! Thumbs up, thumbs down seems to be irrelevant, unfortunately. Like: “Either the loud music or my dancing seemed to work as a repellent.” My money’s on the dancing. Many a CD in my collection was acquired because of World Cafe. I bet you have an amazing CD collection, Linda. Do you still play them? Speaking of radio shows…how do you think the Prairie Home Show will evolve with a new host? Of course, an icon is irreplaceable. If I were writing for Chris, I would search for some character to tell his story each show. Not quite the News From Lake Wobegon but something similar with the other players involved. I will try not to make unfair comparisons to Keillor. If the new host is allowed his own personality it might transition. Anyone who just tries to replace Keillor won’t make it. I do think there is a market for it or it would not have existed so long. However, the expectation it will be the same will kill it. It just occurred to me that GK was successfully replaced before–with TLGMS. they gave it time to evolve and it worked. Maybe lightening will strike twice? True, that, but even while Garrison was doing the the Morning Show there were forces at work trying to get it off the air. With regard to the PHC, I don’t foresee that Chris will attempt to duplicate Garrison, that would be suicide. The shows he hosted last year were fun and were surprisingly good. Whether or not he has the wherewithal to sustain that over the long haul is the big unknown. He has some pretty big shoes to fill, that’s for sure. One reason to think the replacement show will succeed is that public radio badly needs for it to succeed. For decades PHC is the engine that has pulled public radio pledge drives up steep mountains. I think if you analyzed the history of MPR, PHC would be the single most crucial show in creating a public radio colossus. Public radio absolutely needs another smart, musical show to emerge and begin luring more listeners to public radio when it is pledge week. It isn’t clear that the top people at MPR are even very interested in shows like The Prairie Home Companion. If that show didn’t have such a strong following they might have ended it years ago and not replaced it. I know this might be the case because they got rid of the Morning Show when I believe they could have kept it. They probably don’t know how to come up with a show to replace The Prairie Home Companion or might not put much effort into replacing it. I haven’t been listening to radio shows very much recently. I do spend some time listening to the music shows on KFAI where they have many very good DJs. I think KFAI deserves more support. It would be good if KFAI could come up with a way to let Dale develop a show that would be somewhat like The Prairie Home Companion. The live shows that Dale and Jim Ed presented at various locations around the states for The Morning Show were very good. That’s why I doubt it will succeed. Public Radio needs its cash cow so desperately that it will hesitate to change anything decisively. In my opinion, PHC has gotten a little frail. GK does a servicable impression of himself every week, but the show has run its course and is running in part on automatic. If PHC hadn’t existed and was introduced now, given the cultural climate and MPR’s management philosophy, would it succeed? I enjoy the skit work on PHC, as well as the music. I wonder about GK’s health. MPR seems frail to me. It has not developed new shows for new or existing markets for a long time. They seem to be clinging to the existing shows, which I think is a mistake in management. I wish they had a “lab” like the Guthrie does, where the only task is to develop new theatre experiences. Public Radio needs a lab to develop new shows and give them the kind of time and exposure they achieved in the 60’s and 70’s. The really good newer shows are now coming from different sources and I hear them outside of Minnesota Markets when I travel. I have a theory that they may have Wits in mind to be the next big thing. There are skits, “commercials”, interviews and music. I have attended 3 shows and enjoyed them very much although I was clearly not in the target demographic and a lot of it went over my head (below my head?) I have peers that don’t like John Moe or his humor. Some I like and some I don’t. The young people at his shows seem pretty passionate about it. The shows with OKGo and George Takei were great. A show like PHC only succeeds when management isn’t paying attention. Anything as successful as PHC eventually becomes an imitation of its authentic self. I consider “Wits” to be an ironic name for that show, sort of like the housing developments named for the thing they eradicated. I don’t enjoy ‘Wits’. And I think unfortunately it has to do with the sound of the hosts voice. I’m sorry if that sounds shallow, but I have learned over the years how much I respond to that and this guy just doesn’t do it for me. Despite Wits stellar list of guests, I have not enjoyed the quizzes or the host and his writing of the show. I liked John Moe on an afternoon talk show years ago. As a star of a variety show in an evening, I don’t care for his style. it will adapt name and lose all us old farts and go toward a new dimension of npr cuteness is my fear. i am not a fan of directed appeal. i dont think there is a chance this guy has garrisons moxy or quirkiness. nice guy but if the shoe band and guy noir and the players all go away it is not phc any more and if garrison is thinking about how to transition rather than hand over the reins i will be able to see how it goes. He will no doubt continue to own it as he has for several years as Prairie Home Productions. APM distributes it and likely will continue as long as other public radio stations are willing to pay for it. Exactly, cynthia, I think the affiliate stations willingness to carry the show will be key. I’m inclined to give MPR credit for having been very astute in being aware of which way the wind is blowing. Sure PHC has been a cash cow for a long time, and you don’t just dump it. Give it a chance to evolve into something else. If it doesn’t, it’s curtains. The baboons represent a particularly passionate group of listeners that represent the past. I think it would be foolish, for a number of reasons, to include us in too many focus groups on what tack MPR should be taking with it’s programming. I do not for second believe the baboons on this trail represent a majority of public radio listeners anywhere. As I said, our generation is not turned on by Wits but the important thing for survival is to appeal to the younger set. It seems to do that (at least with the captive audiences at the Fitz). So what would represent PR listeners? I agree 100% with Lisa. And yours, Jacque, is the $64,000.00 question. I suspect it will fade and ultimately wink out. Remember when Noah Adams tried to replace PHC with Good Evening? At a time when I needed it most, Dale and Jim Ed played “The Music of Healing” by Tommy Sands. I immediately bought the CD and played it over and over until I believed the words……”the heart’s a wonder, even when we’re torn asunder, love will come again”. Loved that dynamic when they accidentally play the song one needed to hear! Excellent blog, Steve! The radio has helped me connect with a wonderful group of people who actually like the same things I do. I vividly remember listening to the Final LGMS broadcast — laughing, crying — and then sobbing when Peter O played “You Are My Sunshine”. That show was my validation that there were actually others like me, so passionately attached to the Morning Show and everything it represented. Then the Trial Balloon on HD radio and Dale’s online blog where we all started talking to each other and getting to know kindred spirits. I only worked part-time then, so I had the chance to really enjoy that formative time. And now we have our Trail Baboon, the BBC and other informal get togethers. I wish I could attend more of these gatherings as you all are so special to me and I’ve felt more instant rapport with you guys than anyone else I’ve met. You have all blessed my life in big ways and small ways — and all thanks to Radio! Thank you, thank you! coming in late today. It’s been one of those odd days. I grew up with the radio always on. My mother has never had much use for television, but she did love radio (I don’t know if it is the hearing loss or what, but it seems like Dad always has the tv on, and the radio is a thing of the past, just as well given what was on it last time I remember hearing it at their house). Back in the day, she would listen at nights to rebroadcasts of “old”radio- Duffy’s Tavern (where the elite meet to eat, Duffy ain’t here, oh, hello, Duffy), Lum and Abner of the Jottem Down Store, and The Life of Riley. CBS tried during the 70s to revive radio drama with Radio Mystery Theatre which was always on when we were doing dishes. Public Radio in Washington DC in the 90s was a splendid thing, with Diane Rehm, and you suddenly realized that NPR was actually just the local news :). On Sunday afternoons there was something called Songs for Aging Children that was sort of a thematic show. I remember right around Passover was always the Leonard Cohen show. Sometimes it would be songs about gardening, or eating or parenthood, or whatever. Best title for a radio show was also on public radio out there, Stained Glass Blue Grass. Listened to that on my way to church. Loved it. These days, I fall asleep and wake up to the BBC, just like my grandmother did with WCCO back in the day. When I was courting my erstwife and meeting her family, I was always surprised to discover that their AM radio in the kitchen was always on and always tuned to WCCO. If my mother in law was in the kitchen, as she usually was, our conversations had to be shouted over the yammer of Boone and Erickson. WCCO was my maternal grandmother’s morning listening. My dad’s mother always had the polka station out of NewUlm going at breakfast time. Wonder if that still exists. WCCO was my parent’s go-to station in the morning as well. Breakfast every morning included Boone and Erickson, Maynard Speece with corn prices and hog reports and (ugh!) polka music. late nites with the voice??? Last summer when my dad lived with us, he insisted that I have Radio Heartland streaming so he could listen while were were at work. He loved music. I really liked my dad, too. It would have been pure chaos and pandemonium and fun if you and he would have met up. Your two are two of a kind. Radios. What a good storyline today. Thank you Steve for coming up with this. And the replies are great too. I remember as a kid having the AM radio and KWEB was the pop music station and listening to ‘Knock Three Times’. That was my favorite song and I thought Tony Orlando was pretty cool. (I was too young to think much about the Dawns). Somewhere along the line I got a blue transistor radio with the single ear bud (only it wasn’t called an ‘ear bud’ then) but it never worked very well. It was a big deal when I put an FM radio in the barn. And then there was a girl… she was an intern at KLSE / KZSE, our local MPR stations. Catherine something… (Not Lanpher). And she assumed I listened to PHC. So then I had to start listening to it so I could continue faking it. And that led to TLGMS. By that point I was dating Kelly and I’d leave her apartment in the morning and listen to these two goofy guys on the radio. And if something went wrong they just laughed and talked about it and carried on. And that was pretty amazing to me. I still have a lot of CDs. (Recently got ‘Classical Quadrophenia’ by Pete Townshend. It’s good! Crank the car radio and listen to Alfie Boe sing ‘Love Reign O’er Me’! I have always said I do theater so I can listen to music. All the good shops have stereos. (There was a time and a place that had strings of multi colored christmas lights all across the ceiling and you didn’t work on lights unless Pink Floyd was playing and those ‘doo-hicky’ lights were on). While the music may vary, at the college I believe it is my job to teach the kids about good music. Meaning MY music. They want to put their headphones in and listen to their music, fine, but I’m not listening too it. You wouldn’t believe how many kids these days don’t know about Alice and her restaurant. Or Janis. It’s shocking. I stream Radio Heartland. Thank You Mike for keeping that going. Sure miss the jazz. Remember there was a Friday night Jazz show plus Leigh Kammen on Saturdays and he used to be on until 3AM! I liked his programming but Leigh Kammen was such an incorrigible windbag. He could never just say “Duke Ellington”. It was always “Edward Kennedy Ellington”. And that, Bill, was part of his charm. I LOVED Leigh Kammen. I can still hear his mellifluous voice; miss him. Which reminds me: Blues Festival in Mears Park tomorrow from noon to 10 PM. Be there, or be square. There is a station out of Batavia, Ohio near Cincy, WOBO, that I recommend. It can be streamed live. Nothing but music but of a wide variety. One Sunday afternoon one dj played all Polish music then the next guy up played all German music. I requested Komm Gib Mir Deine Hand by the Beatles AND HE PLAYED IT! They have great blue grass and gospel sessions as well as old school soul. The first I listened to much radio was when we could get WLS in Chicago at various times of the day (this was in the latter part of the 60s). But we couldn’t get it all the time; in fact, more often than not, we couldn’t get any radio stations. So, we got most of our music from record albums, but, of course, there was only one record player, so we had to listen to everyone else’s favorites, too, not just our own. I listened to PHC and The Morning Show a lot, as well as some of that classical stuff, back in the day but when kids came along, it became increasingly more difficult to listen to the radio when the kid(s) would wake up early in the morning and never stop talking all the livelong day. It’s very hard, almost painful, for me to listen to more than one thing at a time, so radio has become less important to me over the years. Now I mostly listen to music of my own choice that’s on my mp3 player. But if there was something as wonderful as TLGMs on, I would listen to the radio more. But I’m afraid that ship has sailed. Snort at “all the livelong day”! When my kids were growing up we had a pact requiring all of us listening to one station for a whole week. At the end of the week we would compare notes on what we liked or didn’t like. Naturally this gave us exposure to a wide variety of music and talk. The boy came down on the side of Jazz (not bad) while the daughter and I preferred the oldies. I still like her best but don’t tell anyone. Treasure MPR, folks. With all of its shortcomings and glitches, it is quite possibly the best public radio in the world. I miss it.